For the launch of our first collection we feature an exclusive collaboration with the renowned illustrator Daehyun Kim, better known as Moonassi. Moonassi is an wonderful communicator who works with themes we find interesting. 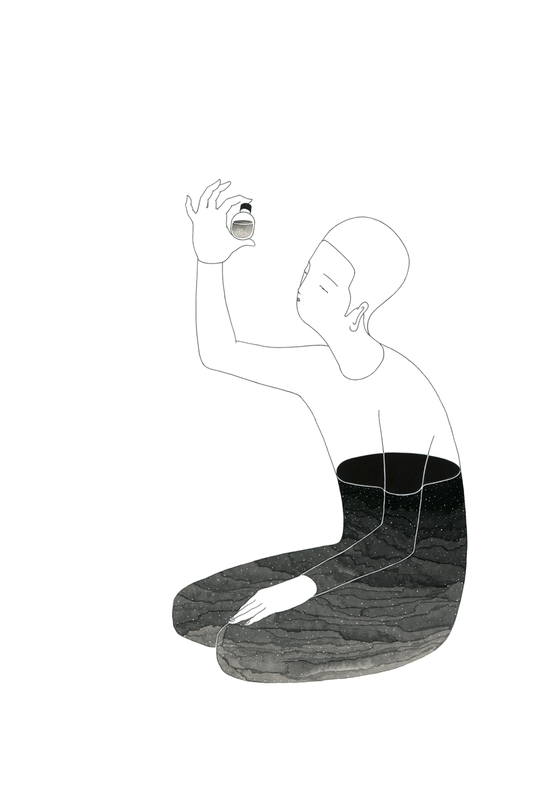 With this partnership, we will show our ideas and fragrances through a series of illustrations, by Moonassi. My work mainly tells about the inner separation that occurs in relationships. When I work and live in the same space with someone else, I feel that I am creating a new personality for the other. I have drawn many pictures of such self-conflicts and conflicts between them. Perhaps it reflects life in East Asia, which, rather than the West, cares for the opinion of the others rather than the individual thought. I usually write before I paint. I focus on writing meaningful sentences or words rather than finished texts, concentrating on them, and embodying them in my paintings. Once I find the right sketch, complete the picture without worrying worries. What has been your biggest accomplishment, and your biggest failure? What I think I did best is that I have been drawing so far without giving up my beliefs and convictions I had when I first started this series. Because I did not give up, I think I was able to create this imaginary world. I am still trying to find something more than that. I think I have not experienced the fatal failure. Rather than making mistakes in the process of painting, there have been frequent mistakes in continuing to live as an artist. Maybe I'm still making mistakes. I just try not to repeat the same mistakes. I am always greedy for finding my own story. There is a desire for new styles and new techniques, but not as much as finding new stories and expressing them. A new story is not something that is completely new in the world. The story is what I can feel in my daily life. I believe that such a story has beauty. What is your best memory of scent? I can not say specifically ‘when’ or ‘what’, but I like the smell of the upcoming seasons that I can take in the beginning of the season in the air. I love the fragrance of the flowers that feel softly as the seasons change in the early spring, and I like the air to breathe in the chilly wind that suddenly blows in late autumn. It is the memory of different times and spaces that the seasonal scent conveys to me. When I take on the fragrance that I have felt somewhere, I feel like I was back in those days. It's not like remembering it as reading a word, viewing a picture, or a video. Talking about scent: What is your favourite Son Venin perfume and why? I feel that my English skills are insufficient to express subtle fragrance, but I really like PUR 01’s pure and clean scent. I do not like strong fragrance that stimulates people around me. I think it is good to have such a fragrance that you can see only after spending a long time together. My girlfriend has the best smell in the world. The fragrance is a fragrance that can not smell. Because we are always together, everything is just so natural and comfortable. So her smell is odorless. It feels to me like ‘home’. The interesting thing is perfume and nostalgia in Korean are spelled differently but pronounced the same. I think the best smell in the world is the smell of home. She has the smell of our home. We truly love your work and how you are able to communicate numeral topics, how would you go along with Making Art Work for perfume? Any topic can be related to me. Find and focus on the relevance. But the topic ‘perfume’ was a bit difficult because I don’t use perfume that much. I thought about 'Why do people use perfume' and ‘What perfume is’. I have found that people are very careful when choosing perfume, more than trying to expose their personality through fashion. Becuase perfume is not just for others, but for yourself as well. I thought perfume can give us a new personality. I wanted to depict it. Sign up for our newsletter for special offers and the latest news.